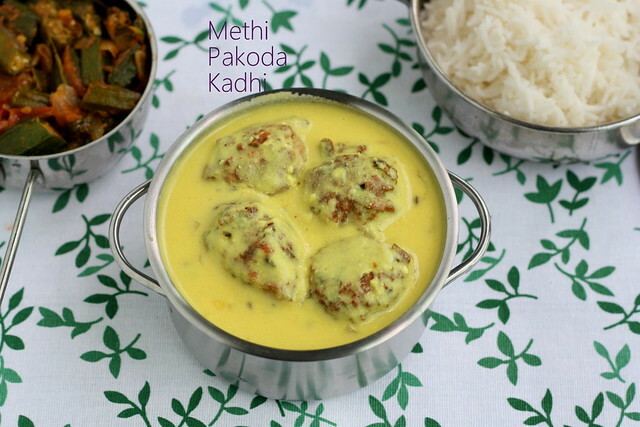 Methi kadhi pakoda, for the first time i tried kadhi after i tasted in my friend’s place and that really turned out so well. I took the recipe from her, the original source of the recipe is from Tarla dalal’s space. I slightly modified the original recipe to suit my family’s taste. Thanks J for introducing such a yummy dish to me. Add all the ingredients (curd,besan, salt ,baking soda)except oil. Make the dough into equal balls and deep fry the balls till golden brown. Add the besan and mix well without any lumps. Add the turmeric powder, salt , asafoetida and a cup of water to this. Cut the onions into thin slices and slit the green chili. In a kadai, add cumin seeds and curry seeds. When it crackles add the onions and green chilli. When this turns pink nice brown colour add the besan curd mixture to this. Keep the flame low and allow the mixture to boil for 15-20 minutes ,stirring in between. Transfer this to a serving bowl and add the pakodas to this. If your not serving the kadhi immediately don’t add the pakodas to this. 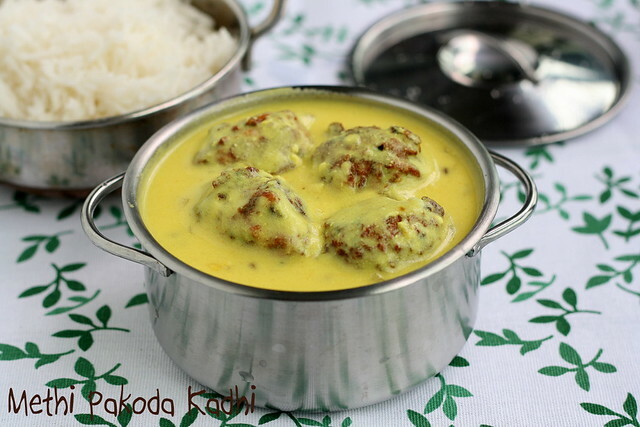 Befor serving just heat up the kadhi nicely and dip the pakodas in warm milk for a minute and add this to the kadhi. Yummy n filling dish.. hv tried this earlier n its a winner !! Awesome presentation n so so colorful!! looks very nice and yumm..
Paakave super a irukku,cute clicks jeyashri,never tasted this so far...Nice recipe! Lovely pics.Never tried this before!! Love the pakodas very much and swimming in the kadi makes it super duper good. Looks fantastic, lovely shaped pakodas. That looks absolutely delicious:-) Love those crunchy pakodas in the soothing kadhi..
Never heard of this before.. Looks so yummy. The colour is so rich! 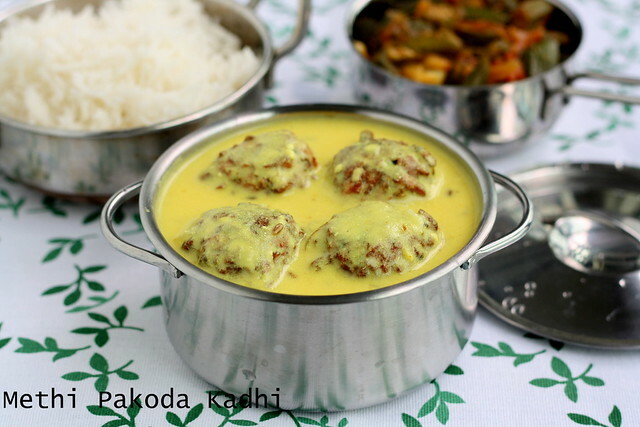 Super delicious Kadhi!!!!! The pakoras look crispy & tempting & the gravy is just perfect & creamy!!! The pakoras look crispy & tempting & the gravy is just perfect & creamy!!! You know what Jeyashri, nowadays your sidedishes/gravy are all new and iam craving for each recipe you post! I couldnt take my eyes off this kadhi...just superb.. So delicious and yummy recipe.The pakora looks so crispy,excellent presentation. Very interesting and perfectly executed..Bookmarked . The picture itself tempts me a lot, irresistible pakoda kadhi..
wow looks so beautiful and delicious too !! Awesome jeyashri..sounds interesting and very tempting! lovely recipe and looks so so good. yUMMY KADHI, NEVER ADDED METHI TO PAKODAS, NICE COMBO. NICE CLICKS. Kadis are my fav too...loved the way you've made it..